T-Mobile.com is back again with yet another web-only special running through Tuesday or Thursday depending on your phone selection. If you’re looking to grab something through Tuesday the Samsung Galaxy S 4G is free for new activation or add a lines! If you want to go for the myTouch 4G the very same deal applies but you have until Thursday June 16th to act. Both of these deals are only good for new customers or add a line activations so take note! Will you go for one of these or wait for something new? ← (Updated: Solved!) Chicago Area Experiencing T-Mobile Outage? Wait for HTC Sensation 4G! I have had the G2 and rooted it, over clocked the processor did the same with my buddy’s MT4G and these two phones don’t hold a candle to Sensation 4G. I just got mine yesterday and there is no comparison. Yes the Sensation is a very nice phone, but the mt4g is a very close second and its fast enough for anybody. Plus when rooted and over clocked like mine running sense 3.0 fusion it run like butta. I did not even understand what you wrote. Do you mean “truth?” Can you just write that please. Hell you do not even know what you mean nor any idea how to concisely express it. That is why you say, you know what I mean or you know what I am saying…..but no one really does. Are you writing in code, or did you have a stroke? What the hell are you saying? Beware all!!!! This is what happens to your brain, when you do not finish high school. Wow… me thinks this is what Washington politicians were referring to when talking about Americans lack of education, aka many people are dolts. Sidenote: Yes, pun intended to illustrate the point (hint: worse, worst, worsen). Will all the TMO sales/specials be for new/add a line? Well. I’ve had my sensation since Sunday, and I can say you are gonna love it. sweet! i hope they get enough at my tmob store so I can pick it up on Wednesday. I know it’s only a few days but it would kill me if I would have to wait till the weekend lol. quick question: what’s your thoughts on the death grip thing? is it noticeable at all in regular use, or is it one of those you’re-never-going-to-experience-this-unless-you-hold-your-phone-like-a-freak issues? I have no issues with mine, Woohoo. Doesn’t everyone say to everyone with one that they love it…….Everyone loved the GX2 in the beginning. Isn’t it too late for me. I just add a new line to my account and have to pay activation fee. I almost forgot is going to be rooted too and be running on CM7. Will they offer the G2X for free? This seems to be the promotion so no. They’d have to have it in stock. I was in a T Mob store yesterday and it is in stock. Talked with the manager and they were never pulled at her store. They did not have but three but they had them. Logged on at 5:19 AM CST just to look and no T-Mobile site at all (server not found). Curious… Sensation 4G update on site maybe? This promotion is NOT to make way for new phones, it’s to gain customers and halt defections. 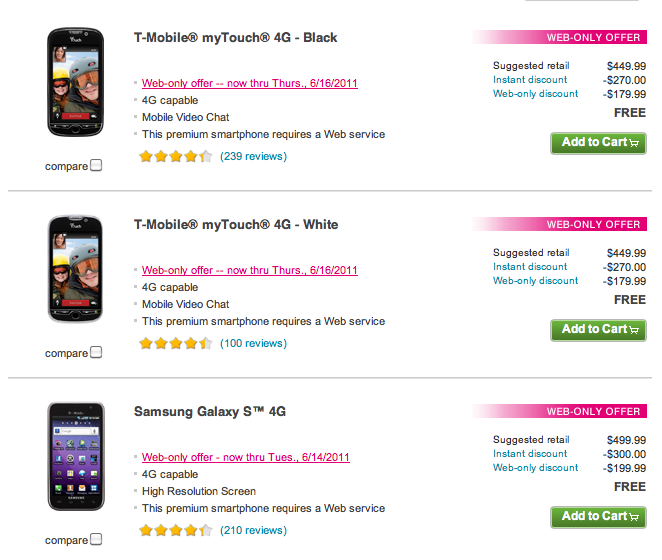 Step back and look at the big picture, T-Mobile is running a lot of promotions (handsets, tablets, talk, data). There’s only one reason to run this many promotions, business is tanking for T-Mobile. I question how T-Mobile’s second quarter numbers are looking. I suspect they are really dismal and this is a “Custer’s Last Stand” to pump up T-Mobile’s Q2 numbers. To T-Mobile’s defense, things are bad everywhere (jobs, fuel prices, etc.) E.g., Last month an article made the rounds off the WSJ (a repeat of a study done during down times): 75% of Americans could NOT scrape together $2,000 in 30 days, to pay for an emergency expense such as a car repair or medical bill). As I said before, people have battened down their economic hatches. My money is on T-Mobile’s second quarter numbers looking worse than Q1, unless these giveaway promotions puts a finger in the dike.